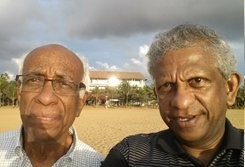 It is my great pleasure to record this virtual interview with my very good friend Rajan “Patas” Ratnesar and I thank him for agreeing to become the 6th in my series in the ColomboMedgrads1962 blog which as we all know, is the brainchild of Lucky Abeyagunawardene. Speedy: Good morning Rajan. Thank you so much for agreeing to be interviewed. Rajan: Good morning Speedy, I know you best as Speedy and shall call you as such during this interview if you don’t mind. Speedy: Don’t mind at all and I shall call you Rajan as I know you prefer that to Patas, although you have no hang-ups being called "Patas" by many. As for me, you always called me Speedy and my other names such as Mahen, Mahendra or Gonsal wouldn’t really sound right. Speedy: All agreed and without any further ado, tell us how you got the name "Patas". Speedy: Well there you are folks, straight from the horse’s mouth! Nick names are funny things and always appear to have a history behind them and I think I am right in saying that we Sri Lankans excel in this. I mean to say, how insulting is it to call a person “gandaya” because of his unpleasant olfactory associations! But I know of one called as such! Rajan: Yes indeed. Remember how we distinguished the Balas by calling them Yankee Bala, Thatta Bala and Con Bala! Hilarious! We know of course that you entered the Faculty in 1962. The photo I am showing you came from your “signature book” which we all had to maintain. Was yours a direct entry or did you do the six months’ course first? Rajan: That photo, gosh, it seems such a long time ago! About my entering the Medical Faculty, I first did the six months’ course in Zoology at the University Science Faculty on Thurstan Road. As Lama mentioned, we had two, one hour lectures, and one practical for a week. Like Lama, I too worked but at the PWD in Ratmalana, basically counting cars in various parts of the country. Speedy: And remind us of any special memories of that time. Rajan: Others who worked with me there were MG and Halin who entered Peradeniya. I saw quite a bit of the country from Batticaloa to Matara, Kegalle, Chilaw and Negombo. Speedy: And how did you get about? I mean your form of transport? Rajan: I used my true and trusted Vespa if the distance was within 50 miles, as far as Chilaw. We were taken by PWD transport for distances greater than that and were housed usually in a school and paid subsistence. My salary was Rs 5 per day, and that was a lot considering a “punt” and plain tea was only 10 cents! Speedy: Coming to your schooling, I know you are a Thomian and I have long forgiven you for that! Rajan: You mean you are not jealous of me anymore that I went to the best Boys school in the Country! It was a wonderful time and I shall always be grateful to my Alma Mater. Speedy: I know we Royalists and Thomians exchange “insults”, but we have the greatest respect for each other, do you agree? Rajan: Of course I do Speedy, goes without saying. Speedy: Any recollections of days at STC. Rajan: Yes one of my classmates from Standard 1 was KD (KDPR). We took the bus to school and of course the wealthier ones were driven to school. We would wait at the bus stop and one of the frequent ride givers was Miss Bay our Std 1 teacher in a little Baby Austin. KD living in Bambalapitiya invariably got picked up and by the time the car reached Wellawatte where we were living then, the car was full, but KD would put his tongue out at me and shake his head! As some of you know, I was unable to pass Tamil at the SSC because I used to treat the class as a joke (which I regret very much now). I was sent to Jaffna and with the teachers there and Tuition from Mr Iyer who taught Tamil at Royal (no praise to the school of course). I was able to pass and enter the University. Speedy: KD or Ranjit Dambawinna always had a great sense of humour. Were you good at sport? Rajan: Yes .I did get Colours in Rowing from the University, captained the Colombo campus and was selected as Cox of the Ceylon crew at the All-India Rowing Regatta in Colombo and Madras. Speedy: I bet many didn’t know that. You said you were a Cox, no, let’s leave it that! Let us talk about your trusty Vespa which I had the privilege of riding pillion with you on numerous occasions. Rajan: I loved that Vespa. I inherited it from my brother Kulan who had passed the bar exam about the time I entered the University, and he had a car. The Vespa lasted through my years in the Medical schooling, provided rides to men, women (or shall I say boys and girls) children, of all races castes and creed. Besides, it took me as far as Badulla to as close as your home in Edward Lane. Mine was not as new as Lama’s. It was EN series but served me faithfully. Speedy: Whenever I think of you and the Med Faculty days, I always picture you in that Vespa with a sideways lean to balance the offset engine. Fine, let’s talk about the Medical Faculty. Can you recall your first week’s experience? Rajan: I remember the ﬁrst day of Registration, after we had ﬁnished the Registration, rather happy that we had escaped a rag. As a few of us were leaving the building, we were escorted to Blom for questioning and of course a workout. But as luck would have it, some guy shouted “Rajasuriya” and our seniors disappeared like ﬂies and one guy told us to jump over the wall (may have been into Bunter’s house) and disappear! Speedy: The magic word Rajasuriya! I hated the Rag and still feel it is nothing but harassment, often for rather dubious reasons and should not be tolerated in a civilised society. Of course the word “rag” can take other more benign forms such as dressing up in fancy dress and collecting money for Charity, nothing against that, most welcome. Speedy: Entering the Faculty, how great a transition was it in your life? Rajan: It was a wish satisfying my father who wanted all his sons, five in all, to become doctors, he being one. He felt there were only three worthwhile professions - Medicine, Law and Engineering. I wanted to be a pilot but my dear father stopped it, and I am so glad he did for today I have been in the noblest profession, like all of us. Speedy: Absolutely agree. If I were to live my life again, I would still choose to be a doctor. Let us reflect for a moment on our teachers. We all remember the great teachers we had and would you like to talk a bit about them? Rajan: I remember our block days and those signatures in Anatomy and dear Prof Chanmugam’s signature class probably half our batch getting his signature almost without having to answer any questions. Speedy: Any other memories of our teachers? 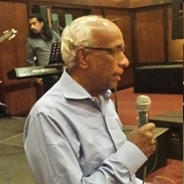 Rajan: I respected all our teachers and lecturers, but one whom I got to know very closely was the late Dr Ernie Pieris (EVP). I did a rotation with him and subsequently became quite friendly. I was President of the Students' Christian Movement (SCM) and he was an advisor and would meet with him quite often seeking his advice and counsel. After I Passed out (my jokes about this asking when did I recover), I was posted to be Intern to Dr Ernie Pieris. As I was leaving Ceylon to do the Internship overseas, I did not tell him before I left which I regret very much to this day. Speedy: I had ward classes with Dr EVP and he was a brilliant and inspiring teacher. You were extremely fortunate to be his Intern. Let us now talk about the famous Law-Medical match. Rajan: Who can forget that, and the aftermath! However, during the week following the incident ,Harsha and I were summoned to the Dean’s ofﬁce and were grilled by Prof. Abhayaratne and Prof. Kodagoda. As far as I remember, we were told to come up with the names, but our batch was united and took the two weeks suspension gracefully (had a good holiday). Our lady classmates made copies of the lectures and distributed them to us. I wonder if we publicly thanked them. If we didn’t, ladies, thanks a lot for your kindness! Some of us went to KD’s place to study at night, how much we studied I don't know, but we did enjoy KD’s entertainment and not to mention the Roti and Hoppers from Mayfair. Speedy: Did you do well in the exams? Rajan: Well, I ﬂunked both Anatomy and Physiology, and thanks to you Speedy, I passed all the exams on my ﬁrst attempt after that. As you know, we studied together and your disciplined way of studying helped me a lot. Speedy: Yes, those were great times and I enjoyed your company very much. You helped me too, it was mutually beneficial. Rajan: Life those days were one of my happiest. Saturday night parties or movies and the adjourning to Lion House for a night cap. The Block Concert, and the plays and the Final Year play, for which I was chastised by the Dean and remember my good friend Vish telling Prof that he advised me (BS!) Vish had as many Arracks or more than I did, before we went on the stage). Speedy: Medical Faculty days will remain memorable to all of us. Any special memories you would like to share with readers? Rajan: There are many more incidents during our days at Kynsey Road not to mention all our heartthrobs, the parties, the pranks and not to mention our services to the community. As Suri mentioned, quite a few of us sacriﬁced a Saturday afternoon in the slums of Kollupitiya, volunteering on behalf of the TB Association checking on patients and making sure they were taking their medication and distributing nutritive material such as milk powder. 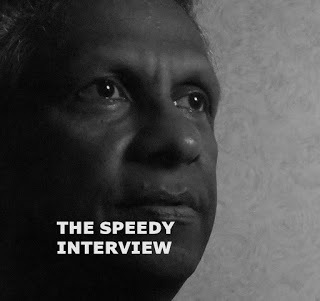 Speedy: I remember studying with you and others at my parents’ house in Edward Lane, Kollupitiya. The garage had a very small room at the back with a separate entrance. I used to share this as a study with my brother. But after he entered the Engineering Faculty, I had it all to myself. Rajan: Glad you touched on this as I must mention my study partners and our study sessions. You Speedy, Lubber and later Harsha, met in this study. We met around 10 to 11 pm and started with our escapades for the day. Each of us had a sort of girlfriend and we exchanged our experiences (or lack of it! ), and when that discussion was over, there was intense study. I am ever grateful to my study partners, and I truly believe my success has been a result of this grounding. Speedy: Let us move on Rajan and talk about your life after completing the Finals. Rajan: As most of you know, I left shortly after the ﬁnal results. Some might wonder why I left. Looking back, there were at least two reasons I can think of, 50 plus years later. The ﬁrst during the ﬁnal months in the ﬁnal year I was in a studying mood, and wanted a post graduate degree. I felt if I stayed in Ceylon. I would end up as a DMO in some god forsaken place. Rajan: I had an offer to complete my internship and service in Malaysia, where I could earn enough for education in England. Speedy: I see. It must have been hard to ignore such an opportunity. Rajan: Indeed it was and I am so thankful I did take it up. With a close family member as head of the Health Department, I was posted to Kuala Lumpur the premier Hospital in Malaysia. But I was posted to the surgical service headed by an arrogant “I am king and Lord” Malaysian Physician. He had training in England and the US, and his team comprised of a Senior Registrar, sometimes a Junior registrar and two Intern House Ofﬁcers. The Senior Registrar had passed the FRCS (not like the present Sri Lankan cabinet minister and former Royal College Student!). Speedy: What was it like to work there and what sort of hospital was it? Rajan: There were only two surgical units and each unit was on call for a week at a time. The boss rarely came in if at all, the Senior Registrars pretty much the same. Most of the emergencies were handled by the Junior Registrar and the Interns. In the six months as an Intern, I had performed quite a few surgeries, both minor and major. When I ﬁnished the Internship, my surgical boss requested I be sent to his team as a Junior Registrar. This gave me more experience and at this point, I decided I wanted to specialise in a surgical specialty. The surgical text book being much larger and bigger than Ob-Gyn, I chose the easy way out and chose to specialise in Ob/Gyn! Speedy: Something crucial happened there, something which determined the future direction of your life. Please share it with us. Rajan: Sure thing Speedy. While I was a Junior Registrar, I met my wife Queelan, who was a Singapore graduate working as an Intern. We are now married for 47 plus years with 3 children and 4 grandchildren.This was probably the best thing I ever did and I am very grateful to Queelan for her love and support throughout my life with her. Speedy: Wonderful! I am sure readers will also like to hear more about your children. I had the pleasure of meeting all of them in my visits to you over the years and I am sure you and Queelan are quite rightly proud of them. Rajan: Yes, we certainly are. My eldest daughter is Neethi who is a Physician and practices Paediatrics and Adolescent Medicine in San Diego. My son Romesh is a Journalist and was Editor of the Time magazine,. He later worked as Chief of Staff to the Under-Secretary of State at the State Department, and now works on the editorial board at the Bloomberg Businessweek. My youngest Meera just completed her doctorate in Education and is the Head of a school in Los Angeles. Speedy: It is lovely to hear of their success and I have no doubt that the home atmosphere and encouragement you both provided, were largely instrumental. Well done! And picking up from where we left, you next went to England? Rajan: That is correct. After two years I proceeded to England. I did stop in Colombo for a few days and sat for the ECFMG, surprisingly with lot of my classmates. Like most of us, I started in London doing a few locums and got my ﬁrst job in Romford at the then Old Church Hospital Romford maternity hospital. From there I moved on to the Royal Northern and Royal Free Hospital in Hampstead. Speedy: I know you then decided to go to the US. Tell us about how this happened. Rajan: It was during my time at the Royal Free getting the training in Obs/Gyn that I thought of going to the US. After having completed my training and the exams, I decided to settle in the US on the instigation of my brother who too was a Physician in Chest Diseases. Speedy: What was it like at the beginning? Rajan: I was exempted for one year of Residency and completed my training at the University of Rochester. Once I ﬁnished my training and passed the American Boards in Obstetrics and Gynaecology, I joined the Faculty and taught for approximately five years. Speedy: You seemed well settled there and I wonder what made you move out to San Francisco? Rajan: The cold got to me Speedy. Rochester is snow bound from November to April and after a few snowskids into the ditch, on the instigation of some of our friends, Lareef, Wickremasekeran, Anton and Vish, I too decided to relocate, but unlike the others who were around Los Angeles, I settled in the San Francisco Bay Area, because my wife being Chinese, wanted a Chinatown. San Fran won! Speedy: What sort of work did you start off with? Speedy: That is quite impressive Rajan. Do you think you would have done as well if you stayed in the UK or is there something special about opportunities in the US? Rajan: I really don’t know Speedy. At the time I was in England in the early 70s, there were few if any overseas Consultants in my field. Most non-English doctors were Senior Registrars at the highest, or went into General Practice (GP). The US gave opportunities for all and I took these offers and that may have made the difference. I still love London, but the weather was not my cup of tea. Speedy: Did you continue in this path or did you change direction? Rajan: I developed severe Osteoarthritis of my right shoulder and had to have a shoulder replacement. This ended my active clinical career. I then started working as an Administrator in the hospital as a Medical Director and subsequently in an insurance company initially as a Medical Director and subsequently as Chief Medical Ofﬁcer. This is very different. I had to learn all specialities and sub specialities (I have Harrisons Principles at my bedside!) mainly managing appropriate use of resources also associated with it. I also was elected by my community to the directorship for healthcare in my district and ran for ofﬁce for two successive terms and won. Speedy: Recognition of your capabilities is always rewarding. That must have been a big change and did it take a long time to get used to your new role? Rajan: In life Speedy, you must adapt to circumstances and be willing to learn and do what is best for you. I knew my surgical career was over and I just moved on and learned to like what I did and I am quite proud of my achievements. During this period I served as the Chair of the Board, and negotiated to build a new Hospital for the community. As in all countries, there is lack of healthcare for the underprivileged. Working with a non-proﬁt agency, I helped to start a primary care clinic for these people which is now federally qualiﬁed and funded when previously it was dependent on charities and volunteer services from Physicians, nurse practitioners and nurses. Speedy: That was awesome! Well done. Doctors have so many roles and serving the Community is such an important one. Rajan: Thanks Speedy. Well, time marches on and I am now retired, my wife and I provide emergency babysitting services for our Grandchildren ﬂying to Washington DC, to Los Angeles to San Diego. Speedy: That is amazing! That is a lot of flying and travelling. Your children are very fortunate to have parents like you. When I visited you in San Francisco, I recall playing Golf with you at a lovely course. Do you still indulge in the Noble Game? Rajan: Sadly no. I gave up golf because of my shoulder problems but I hope to start again. Speedy: You must Rajan. Golf is balm for the body and mind! Any other projects, interests and hobbies? Speedy: A noble sentiment indeed. What do you consider your proudest achievement? Rajan: This a difficult question because there are many things I am proud of, but probably the proudest is that I have a loving family of children, grandchildren and siblings not to mention my faith. I also have to say that I am also extremely proud to have been able to witness the development of many friends who have gone on to achieve success in many fields be it Music, Finance or just being good and caring Physicians. Speedy: And that, Dr Rajan Ratnesar, Obstetrician and Gynaecologist, Alumnus of the Faculty of Medicine, University of Ceylon, Colombo, Medical Administrator, Husband, Father and Grandfather, valued colleague and sincere friend, is a good time to close this Speedy Interview, the 6th in my series. Thanks again for talking to me. Rajan: Speedy my long standing friend, it has been my pleasure. What a wonderful story of the life and times a' bon vivant' of our batch. It certainly gives an insight into his colourful life. I remember Patas as a kind and jolly person who brought laughter and happiness to our batch. It is so great to hear he has had a successful professional career and a happy family life. We have another thing in common in having Chinese better halves!! Well done my good and faithful friend. May you continue to enjoy life as you have always done. Congratulations to Mahendra for yet another masterpiece of an interview - searching but respectful and dignified. Well done,Speedy,under your guidance,our Patas sailed through 3rd MB onwards without any obstacles. I,never new,that Patas did his internee period in Malaysia. I,am certainly proud of achievements,of all our batch mates. Rajan's achievements reaffirm the proverb "failures are the pillars of success". I,also like to quote an Arabic proverb,which certainly apply to all the Srilankan expatriates. "A man belongs where he settles and not where he grew up;where he is now and not where he was born. "One more incidence,I still remember is that you were asked to perform a PR examination by late Antho.You said;I haven't done it before.Antho replied that "Mr Ratnesar"if your father told your mum that "I had not done it before",you would not be here.We,certaily had a good laugh.I,am sure you have n't forgotten about that. I ask my worthy batch colleagues with great humility to please comment on the publications on this blog and support our batch. Mahen and Patas have spent a great deal of time and much effort to produce this brilliant interview. Your views and comments whether flattering or otherwise will I'm sure be greatly appreciated. Read your interview of Patas with much interest. As always it was well done. Congratulations on your great sense of wit and wisdom in extricating the interesting info of the person being interviewed. I strongly endorse ND's comment. I know how much time and energy both the interviewer and interviewee put in to make this readable and provide excellent entertainment to the viewer. It's a pity that few if any, make comments. Some don't visit the blog at all. Quite a few don't know about its existence! That is why I send the link to those in my e-mail list. I am going to do it with this one as well. I,am certainly missing witty comments from Rasaque.Hope he is in good health at the moment. I do n't want to express any ideas and end up in trouble.Some may take them as too sarcastic. Good observation Sumathi. I think all us regulars like would be more participation but as you say, we have to accept the way it is and like Lucky has pointed out, a lot of people probably view it but for reasons best known to them, do not actually post comments. Thank you Mahendra and Patas for the very informative interview. Patas ,I think you worked at the City of London Maternity Hospital,in London for a brief period either in 1971 or 1972.I visited that hospital between April to September 1972 when I worked as a SHO in neonatal paediatrics at the Whittington Hospital in north London. I came across a book you had left behind in that hospital. I will be useful to know whether colleagues like reading my Interview Series. I certainly enjoy doing them. It is quite chastening to realise that more than 50 years have passed since we entered the Faculty and I find the history of personal and professional achievements of our colleagues most refreshing and interesting. I hope Readers do too. Mahen and Rajan, sorry about the delay in showing my appreciation of the above interview. It is great to learn of the many achievements of our batchmates whom we didn’t have the good fortune to get to know. Rajan, I remember you very well, and am very impressed with all you’ve achieved academically as well as in your family life, and wish you, and all your family the very best in the years ahead. Well done! Lucky, Mahen, ND, Thankyou for all you do to keep the blog active. Shall do my best ! Thank you Rohini and thank you Speedy and others for the usual kudos that I get. Even if half of the 1,050,972 hits made so far are Robots, we are not doing that badly. Due to many difficulties and reasons, some who visit the blog regularly don't comment. So, the number of comments is only a very rough estimate of the following we have. What I like about our blog is that the subjects are so varied. Speedy should get the credit for the innovative features like Creative Spot, Virtual Interviews etc. Thanks to all of you for your kind sentiments. It has been a long road but I am grateful to many of you and cherish the memories of our days together. I know there are many in our batch who do have an even more exciting story to tell. Hopefully as my good and loyal friend "speedy " continues the series we will learn more. Patas, did you work at the City of London Maternity Hospital? 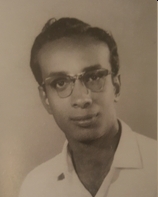 As I have mentioned before in these columns, long before I got to know Rajan, I had met his elder brother the late Kulendran (Kulen) when he was a Law Student (around 1957 when I was a schoolboy). Correct me if I am wrong Rajan, but I think Kulen used your Vespa at that time (I wish to recall here that our batch colleague Douglas Mulgirigama used a similar model Vespa that was owned by the late Dr. Bala Karalapillai who was my next door neighbour in Manning Town when he himself was a medical student around 1956. Mainly due to our alphabetical seating arrangement in the lecture theatre and grouping for clinical work, I had very little contact with Rajan in medical college. As medical students, I joined the vast majority in calling him "Patas". However, after graduation when I had more contact with him, I started calling him Rajan. I have had occasion to visit Rajan in his beautiful home in Castro Valley where I met his beloved wife Queelan for the first time. On that occasion, Rajan presented to me a copy of his son Romesh's latest book at the that time - "Tear Down that Wall" which has found a permanent place on the shelves of my small library at home. Of interest to blog readers may be that this particular book has been dedicated to his parents - our friend and colleague Rajan and Romesh's mother Queelan. I must also mention that I am quite familiar with Castro Valley and surroundings because I had spent two years in the San Francisco Bay Area in 1974/1975 when I did my first post graduate degree in Public Health (MPH) at the University of California in Berkeley. Congratulations Speedy on another great interview. Patas ( I am sorry I can't change after 55 years) your story is fascinating and very candid. You left out the fact that it was one of your objectives to teach all the girls who did not dance to master the art. I have a vivid memory of you steering me across the King George's Hall muttering slow slow quick quick under your breath ! We had a lot in common myself being an ardent Thomian Supporter and an active SCM member.I do agree on your comments on Dr E V Pieris I had the privilege of doing my internship with him. He taught me so much more than just medicine. Wish you all the very best in your retirement and happy times with your grand kids.